Stereotypes and fears are brought to the surface when Maine gets tied to a terrorist attack in Kenya. As claims of a Maine connection to last weekend’s terrorist attack on a Kenyan shopping mall have become more dubious, voices within the state’s Somali refugee community have grown louder and angrier. They want to know why newspapers, TV stations and politicians so quickly repeated allegations from an obscure Twitter account that Somali-Americans from Maine and other places in the U.S. had helped carry out the attack. Although radical groups have used social media to get their message out, most major media outlets immediately questioned the story’s legitimacy and did not name the alleged U.S. terrorists. Critics, however, said the rush to report on the questionable tweets was still harmful to Somali-American communities. Dini said he is not aware of any acts of violence perpetrated against members of Maine’s Somali-American community since the story broke, but there has been an unmistakable backlash. Somali-Americans have been berated on the street, blasted on TV and the Internet, and subjected to public insinuations by politicians, he said. U.S. Attorney General Eric Holder has said there is no clear evidence of a connection between any Americans and the attack on Nairobi’s upscale Westgate Mall by Somali terrorist group al-Shabab, which killed at least 67 people and wounded more than 200. Even though the likelihood grows that the Twitter allegations are false, Dini said, that doesn’t mean the negative treatment of local Somalis will cease. “You already have three strikes against you because you’re black, you’re an immigrant and you’re Muslim,” he said. Dini said young people are particularly sensitive to negative public attention because they have become deeply assimilated into the non-Somali culture in Maine. “Those who grow up here or were born here are those directly affected,” he said. Twitter shut down an account linked to al-Shabab shortly after it claimed responsibility for the attack. The group created another account, which has also been suspended. But Twitter staff does not monitor content unless the posts are unlawful or threatening. Those are suspended only after reports of violations. By the time the accounts linked to al-Shabab were shut down, the information had spread, even given their questionable authenticity. 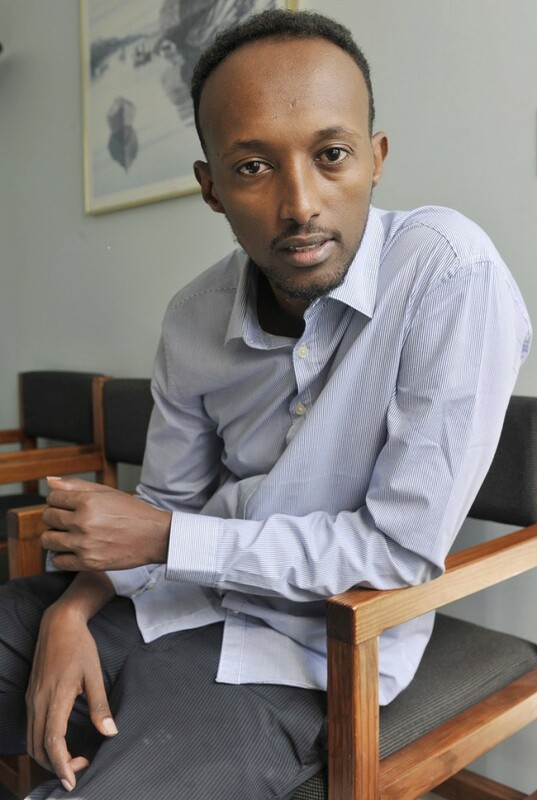 The fallout hurts peace-loving Somali-Americans who are often treated as being guilty by association, said Abdullahi Ahmed, a Somali-American science teacher at Deering High School. Dini also was critical of the way politicians, including U.S. Sen. Angus King, an independent, responded in the immediate aftermath of the news. Dini said politicians’ vows to go after any wrongdoers from the U.S. read as though they assumed some Somali-Americans had participated in the attack. King’s communications director, Crystal Canney, issued a written statement Friday saying the senator did not make any assumptions about a possible Maine link to the attack. “Our statement was intended to let the public know that the Senator was aware of the situation, that if there was a connection that it would be pursued, and to remind people to avoid assigning blame to members of the Somali refugee community,” she wrote. Two events coincided on Sept. 22 that appeared to lend credence to the idea of a Maine connection to the Westgate Mall attack. The morning after the Sept. 21 attack commenced, the media reported that the FBI was investigating whether al-Shabab was trying to recruit Somalis in Portland, citing an incident dating back to 2007 in the Minneapolis-St, Paul area, where at least 40 Somali-Americans were known to have been recruited by the terrorist group. There are more than 80,000 immigrants from Somalia in the Minneapolis area and roughly 6,000 in southern Maine. Also on Sept. 21, a handful of European blogs posted versions of a list of alleged participants in the attack. Each of the published lists contained nine to 17 names and places of origin, including three to six people described as being from the U.S. Within hours, media outlets, including the Portland Press Herald/Maine Sunday Telegram, began reporting on the alleged Maine connection to the attack, citing both analyst statements and the publication of a list of alleged participants. The Press Herald did not publish the names because they could not be independently verified. Efforts to verify the identity of the Maine name turned up no evidence that the person existed. Most news articles were skeptical about the list, which reportedly came from a now-suspended al-Shabab Twitter account. Still, the possible connection to Maine and other U.S. states, including Minnesota, Illinois and Arizona, became a major national news story. Journalism ethics professor Robert Dreschel said the mainstream media’s decision not to repeat the names on the list was wise, although it may not have prevented harm to Somali communities. “It goes beyond that into casting an aspersion on an entire community,” said Dreschel, director of the Center for Journalism Ethics at the University of Wisconsin-Madison. The ability of digital social media to spread information quickly and the pressure on news outlets to get the story first can create a “lethal combination,” he said. But, he said, the demand for immediacy in reporting, especially online, works against that ideal. “Everybody else is going with it, so now what do you do?” Dreschel said. If al-Shabab did tweet the list of alleged attackers, it was not the first time the terrorist group has used social media to control its message. Several Twitter accounts linked to al-Shabab have popped up in the past two years and been suspended for violating Twitter’s use policy. Counterterrorism groups have also used social media as a way to research terrorist groups, using Twitter accounts and other social media to gauge the groups’ reach and track their supporters. The National Consortium for the Study of Terrorism and Responses to Terrorism at the University of Maryland recently studied al-Shabab’s Twitter feed and discovered that its reach has grown considerably in the last year, in part because of social media. “Twitter is powerful because it’s in real-time,” said James Sheehan, one of the authors of the study, in an email. “A supporter of al-Shabaab in the US or UK can follow events as they are happening, creating a sense of urgency and excitement among sympathizers. Supporters may feel that atrocities against Muslims are happening right now, the war is being waged and all the while the readers are merely sitting at home. Sheehan said groups like al-Shabab have effectively used social media to promote their message as reliable, whether it is or not. “One thing that al-Shabaab has been really effective at on Twitter is focusing their message on some key points, namely the promotion of their overarching narrative of the conflict, descriptive messaging about specific attacks focused mainly on their operational capacity, and promoting their group and media products as the only trusted source of information,” Sheehan said. Sheehan also said that because Somalia’s technological infrastructure is stable and robust, groups such as al-Shabab can easily use photos and videos as part of its message. “Access to these photos and raw footage which is then edited into propaganda videos and spread over the Web has easy pathways to the West,” he said.